If you book directly through us we would require either a one day full price deposit or £10 deposit for each day you book. This will be subtracted from the total bill on your arrival or will be kept by us if you fail to arrive. If you book through one of our partner site we still reserve the right to charge you for one full night if you fail to arrive and notify us at least 48 hours prior to your arrival due date. This charge will be in addition to the booking fee retained by our partner sites. You can pay your deposit with any major credit card. If you do not have a credit card, please send us an e-mail and we will try to think of something. We will normally count it a night if you sign in before 5 am. If you sign in after 5 am we can not always guarantee you a sleeping place until 10.30 am. In the same manner we would expect you to vacate your bed by 10.00 AM on your departure day for the benefit of arriving guests. All groups of four and more people MUST contact us in advance if they choose to stay in MidTown Hostel to discuss the need for safety deposit. All dealings with groups will be done through designated group leader. City centre is built usally around main square, right? So if you consider that Midtown Hostel is like 200 m from main square, you may get a impression about our location. Almost everything in walking distance, bus station 5 min, train station 7 min, arena for all events some 7 min, going to pub takes 5 min and coming back 10 min (for obvious reasons ). You know, the thing is, what you are looking for. Because we cannot make happy everybody. Well, we do our best, but you know, sometimes whatever you do, its just not enough. Going out in night is hassle free since we dont have any lockout time. You get your code for the entrance, and you can come back anytime you want. Most of the time staff is waiting to check on coming guests if they are not out of control to keep hostel calm, so almost never happen that something wake you up in middle of the night. In any case, staff is open to complains and ready to solve them. Also in our communal kitchen you find all equipment to warm up your food or cook something. Free tea, coffee , milk and SUGAR are standard, at least for us. We also have a lounge where you can relax, watch tv, spend time playing games on PS3 , playing chess or monopoly, but honestly, most of the time guests are sharing experience, ideas and knowledge what sometimes create stunning picture of mixture of languages, cultures and stories. Or you can just surf on internet using free WiFi. And the last thing. We are not 100% by all means and measures, no. But rest assured, that we are good 90 to 95% and we are proud of it. 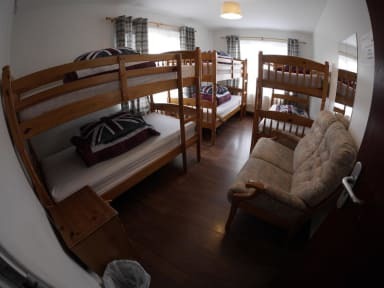 We understand that clean sheets are a must to survive as a hostel ( although we dont understand why some people think we gave them used one, its kind a mystery ) and we understand that you want hostel where you feel good and secure, without being afraid of saying your request to management. And that is what we are trying to achieve. We are small hostel, with four dorms. 7 bed dorm and 6 bed dorm, triple room and twin room. Also, we dont have huge rooms, but some 95% of people are happy with their beds. But sometimes it looks like people expect penthouse for 2 pounds. But being small is a great advantage, because we know your name, we know where are you coming from, and most probably, if you stay longer than one night, you will be leaving as our friend. Our rooms have shared bathrooms an toilets. In case you have expensive things, we can provide locker so nobody can nationalise them.